When it comes to automotive engines, there are four primary types of crankshafts used. The engine’s primary application determines which type of crankshaft is best suited to provide adequate performance and durability. Below we will take a look at the common types of crankshafts that are found in today’s engines and discuss the manufacturing processes used to create them. Cast iron crankshafts are most commonly found in ordinary passenger car engines and are favored by automobile manufacturers because they are inexpensive to produce. A cast iron crankshaft is made from molten iron or steel and simply poured into a mold. The raw casting is then rough machined so that it can be ground to its finish dimensions and then balanced. 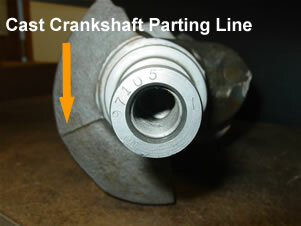 These types of crankshafts are relatively inexpensive and can be purchased new for $200 or even less. Since cast iron crankshafts contain flakes of graphite flakes, these crankshafts often have a grey visual appearance. Nodular iron crankshafts are manufactured in the same way as cast iron crankshafts, but the composition of the iron is slightly different. The inclusion of graphite nodules, instead of flakes, adds strength to this component. Cerium and magnesium are also added to further strengthen the crankshaft. Nodular iron crankshafts typically have a carbon content of 3.3% to 3.4%. Many aftermarket cast crankshafts are composed of nodular iron materials for added strength. Although nodular iron crankshafts cost slightly more than a cast iron crankshaft, the added expense is well worth the increased tensile and fatigue strength of the crankshaft. Unlike cast steel, forged crankshafts are produced by using hydraulic presses to compress molten steel into its final shape using dies instead of molds. Unlike a casting process, which leaves a sandy grain in the crankshaft, forged steel crankshafts, have a uniform grain structure that adds a significant amount of strength to the final component. Most forged crankshafts are made from 4340 steel, which is a low alloy steel that contains nickel, chromium and molybdenum. 4340 steel can also be heat treated and does maintain an acceptable fatigue strength for moderate to high performance applications. Billet steel crankshafts are by far the strongest crankshaft available and are used for extreme high performance applications such as competitive racing. A billet steel crankshaft starts out as a large round ingot of forged steel and is machined to produce a parallel grain that is consistent. The grain structure of a billet steel crankshaft makes it more durable than any other crankshaft option currently available. However, this strength comes at a cost that can exceed $2,500.00 per crankshaft. It is important to note that the steel used to produce billet crankshafts also commonly differs from forged crankshafts. 4330 steel, for example, is a nickel, chromium and molybdenum alloy steel. The carbon content in this grade of steel is on average .30%; making it quite durable for engines that are designed exclusively for race applications. Please note that specific steel designations, such as 4330 and 4340, refer to SAE International’s specifications regarding the grades of steels, their composition and metallurgic qualities. While there are various types of materials used to produce crankshafts, of varying fatigue and tensile strengths, they are typically hardened to produce a final crankshaft that is even stronger. For performance applications, crankshaft flex is not uncommon at high RPMs. Forged and billet steels are better equipped to flex and return to their normal state. Cast and nodular iron cranks, on the other hand, are extremely brittle and more susceptible to cracks. Identifying cast and nodular iron crankshafts is quite easy when you look at the casting lines. Thin casting lines, as in the image to the left, indicate that the crankshaft has been produced using a casting process. Steel forged crankshafts, on the other hand, tend to have wide forging lines. Billet steel crankshafts are typically smooth and will not have any visible casting or forging lines. Now that you have learned more about the different types of crankshaft material compositions, and how to visually distinguish them from each other, please take this opportunity to rate the information on this page below. This entry was posted in Diagrams on August 6, 2013 by admin.